Recycled_Red_Kraft_Snap_Closure_Portfolio is rated 5.0 out of 5 by 3. Rated 5 out of 5 by Be828 from Love these I've reordered these several times- they are great for presenting proposals to clients or magazines and PR package info to potential clients. Rated 5 out of 5 by tcao from durable and nice looking folder I used this folder as a welcome package and was very pleased with the quality. Rated 5 out of 5 by cnewcomb from Great for client presentation My law firm purchases hundreds of these portfolios to use in presenting clients with formal documents (mostly their issued patents). It is a great way to present important documents and a keepsake for clients to use if they choose to not frame their document. Professionalism is key in every aspect of working life. Dress smart and you'll get the job. Carry yourself confidently and you'll get promoted. Simple advice to abide by, really. However, the one aspect of your professional life (and everyone else's for that matter) that may be downright unprofessional, is how you (and everyone else) deliver documents. 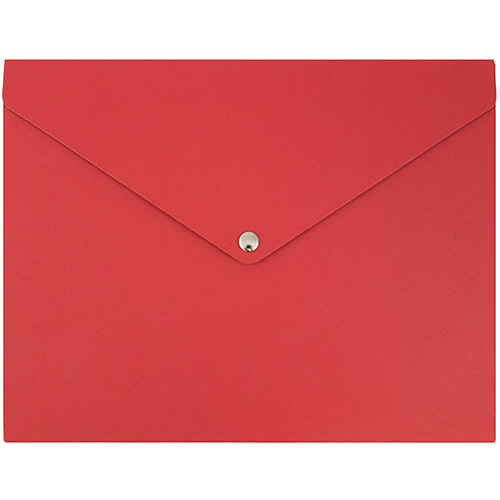 More often than not, envelopes and mailers meet the business end of a letter opener and not only does that create a mess of paper shavings, many people get a little grossed out by the thought of someone else's lips touching the adhesive on their envelope. So save someone the trouble and discomfort of a traditional envelope and invested instead in some Recycled Kraft Snap Closure Portfolios. It's the professional thing to do. Recycled Red Kraft Snap Closure Portfolios feature durable snap closure buttons, sturdy kraft paper construction, and are 100% recycled too! Recycled Red Kraft Snap Closure Portfolios are 9 1/4 x 12 1/4 x 1/2.